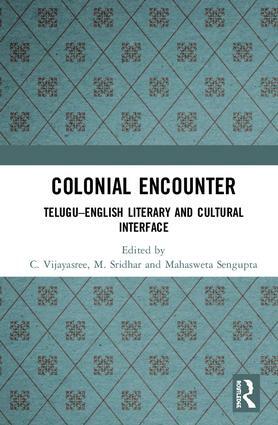 This book focuses on transactions between English and Telugu through a study of translations and related works published from about the early-nineteenth century to mid-twentieth century. Moving beyond Edward Said’s theoretical paradigms which suggest that these interfaces were driven by imperial and colonial interests, the essays in this volume look at how they also triggered developments within the indigenous literary and cultural practices and evolved new forms of expression. The book will be of great interest to scholars and researchers of linguistics, translation studies, comparative literature, cultural studies and modern South Asian history. C. Vijayasree was Professor of English at Osmania University, Hyderabad; the Director of Osmania University's Centre for International Programmes (OUCIP); and Vice-Chairperson of the Indian Association for Commonwealth Literature and Language Studies (IACLALS), Hyderabad, India. As the author of twenty books and fifty research papers, she is well-known in the field of postcolonial studies. Her publications include Suniti Namjoshi: The Artful Transgressor (2001), Mulk Raj Anand: The Writer and the Raj (1998), Writing the West: Representation of the West in Indian Literatures (2004, editor), and Nation in Imagination: Essays on Nationalism, Sub-Nationalisms and Narration (2007, coeditor). She also co-translated (with T. Vijay Kumar) Gurajada Appa Rao’s Kanyasulkam and Volga’s Vimukta as The Liberation of Sita. M. Sridhar isformer Professor, Department of English at the University of Hyderabad, India. He has published extensively in the areas of literary theory, comparative literature and translation. He has been engaged in translations (with Alladi Uma) for over two decades – among their recent translations are Untouchable Spring by Kalyana Rao and Sorajjem by Akkineni Kutumba Rao. Mahasweta Sengupta is former Professor and Head of the Department of Literature in English at the English and Foreign Languages University, Hyderabad, India. Trained in English literature, she later moved into comparative literature and translation studies in the 1980s and published seminal articles in books including Translation, History and Culture (edited by Susan Bassnett and André Lefevere, 1990) and Between Languages and Cultures (edited by Carol Maier and Anuradha Dingwaney, 1995). Her interest in postcolonial literatures and translation studies prompted her to look into translations done during the colonial period in India from Bengali to English. Widely published, her inclination towards translation studies grew out of her interest in literary theory and cultural studies.